Imagine you’re walking down the street and you run into 7’1” Shaquille O’Neal. Leash in hand, he’s taking his beloved dog for a walk. What breed is he walking? If you’re like most people, you’re probably not picturing Shaq with a Pomeranian or Chihuahua. Seeing as he himself is quite the opposite, you’re probably picturing a breed that can’t quite fit itself and seven of its teeny tiny friends in Shaq’s size 22 shoe. They’ll keep you warm, safe and happy. What more can you ask for in a companion? If you’re a tall soon-to-be dog owner and you’re looking for a big boofer with a big heart, you’re in luck. There are tons of large dog breeds in need of a loving home somewhere near you. Talk about a dog with a big heart (and somehow bigger poops). Saint Bernard’s are known for their all around friendliness and love for their owners. They make great family pets due to their gentle and loving nature. The bigger the family, the better, as these dogs hate to be left home alone and would prefer spending the entire day by your side. Even though they want your attention, their overall vibe is that of a lazy Sunday afternoon. They’re perfectly happy to be your napping buddy for life. Before adopting a Saint Bernard, you may want to invest in a king size bed as they often forget how big they truly are. 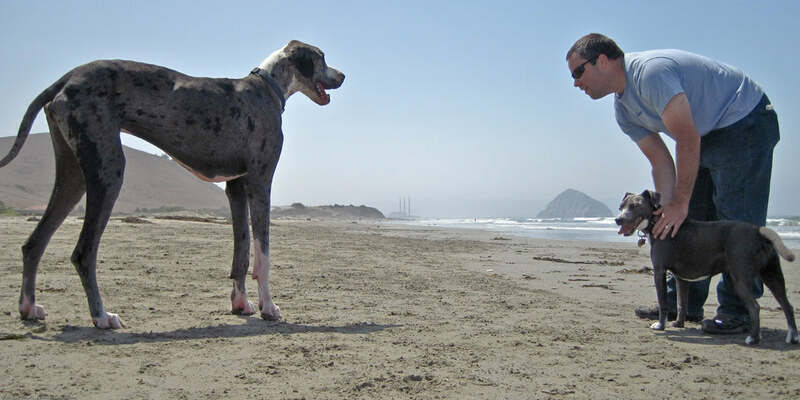 When most of us think of a large dog, one of the first breeds that comes to mind is a Great Dane. These dogs are known for their sensitive and kind nature, but they’re definitely known for being a little rowdy. It would be difficult for someone closer to their size to manage them as their energy levels are high and their desire to play is, too. While they may be difficult at times, they are similar to Saint Bernards in their trainability and their love for humans. Because they may not make great dogs for small humans, there are plenty out there looking for their forever homes and would love to meet you! You won’t find a dog nearly as goofy or nearly as loveable as a Bernese Mountain Dog. These big fluffy teddy bears are down to snuggle with you on the couch or curl up in bed, but their ideal day is a day of playing at the dog park or a day of exploring in the cold weather. They’re great with kids, great at tricks and great at shedding. But seriously, you’ll need to invest in a serious amount of lint rollers if you’re thinking about adopting one of these walking carpets. If you’re into big dogs, and you’re not into drooling, an Irish Wolfhound might be for you. Not only do they keep the drooling to a minimum, which is pretty rare for big dogs, but they tend to be pretty quiet as well. They love people of all sizes, familiar or not, and they’re great with other dogs. Their only downfall is their heightened prey instincts, which is why they need a big owner such as yourself to help them stay calm cool and collected when they’re being mocked by squirrels in the park. Another dog that will fit right in to your family dynamic, Newfoundlands make great pets. They may take a little longer to warm up to you due to the fact that they’re a bit more timid around strangers than the previously listed breeds, but once they know they can trust you, they’ll be by your side for life. Newfoundlands are a breed that misses their owners very much in their absence. Luckily, they make great travel buddies, especially if you’re headed up north where it’s nice and cold, or better yet, snowy! Great Pyrenees are basically just giant fluffy babies. They’re very sensitive, hate storms, love to be snuggled but are okay at home alone as long as they have peace and quiet. Though they’re pretty smart dogs, they don’t take well to training and seem to have a hard time remembering what they’re taught. But with dedicated practice and patience from their owner, they’ll do their best to please in the ways they know how. Life gives us no better reward than the love from animals. As a tall person, you can maximize the amount of love and affection you receive from your pet by adopting a big dog with lots of love to give.